A still from Coalition video of the airstrike on the homes of Basim and Mohannad Razzo (from “The Uncounted,” by Anand Gopal and Azmat Khan in The New York Times Magazine). This event is free and open to the public. Wine, cheese, and light refreshments will be provided. All are welcome! Registration is required (register here). 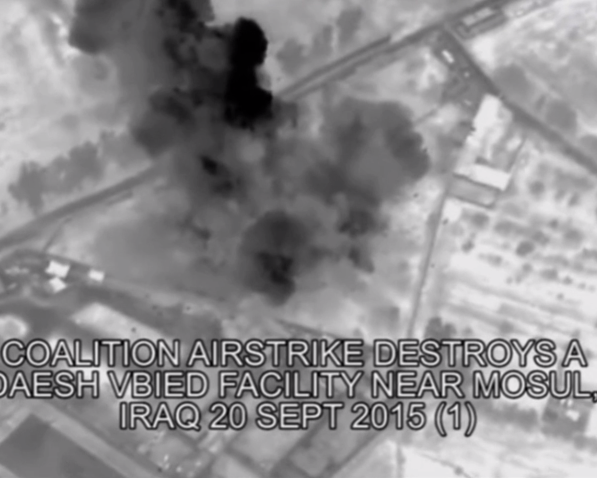 America’s war against ISIS has been touted as the most precise in military history. But an on-the-ground investigation of civilian deaths tells a different story. The INCITEment Series is proud to host Pulitzer Prize-nominated journalist and sociologist Anand Gopal, who will present on the moral and legal implications of the war on terror. A discussion between Gopal and investigative reporter Azmat Khan, facilitated by sociologist and INCITE director Peter Bearman, will follow. Anand Gopal is a journalist and sociologist who has worked extensively in Afghanistan, Syria and Iraq. He has reported for Harpers, the New Yorker, the Wall Street Journal, the New York Times Magazine, the Christian Science Monitor and other publications while also producing scholarship based on his fieldwork and complex network analysis. His book, No Good Men Among the Living: America, the Taliban and the War Through Afghan Eyes, was a finalist for the 2015 Pulitzer Prize for general non-fiction and the 2014 National Book Award. He won a George Polk award for magazine reporting in 2017 for his article “The Hell After ISIS” in The Atlantic, which tells the struggles of one Iraqi family caught between Islamic State terrorists and United States-backed forces. He received his PhD from Columbia University and is an assistant research professor at the Center for the Study of Religion and Conflict and the Center on the Future of War at Arizona State University. His current work focuses on ISIS and other political actors in Iraq and Syria, where he travels frequently. He speaks Dari, Pashto and some Arabic. Azmat Khan is an investigative reporter, a New York Times Magazine Contributing Writer, a fellow at New America, and a Visiting Professor at Columbia University. Her accountability reporting for the PBS series FRONTLINE, The New York Times Magazine, and other outlets has earned the National Magazine Award for Reporting, the Overseas Press Club Award Ed Cunningham Award, the Daniel Pearl Award for Outstanding Reporting on South Asia, the Deadline Club Award for Magazine Investigative Reporting, the Hillman Prize for Magazine Journalism, and other honors. This event is part of the INCITEment series, created and hosted by the Interdisciplinary Center for Innovative Theory and Empirics (INCITE). INFORMATION: For more information, please email Sam Lutzker at sal2176@columbia.edu . This event is FREE and open to the public. Wine, cheese and light refreshments will be served.